The global ocean on Jupiter’s moon Europa contains about twice the liquid water of all the Earth’s oceans combined. New research by Richard Greenberg of the University of Arizona suggests that there may be plenty of oxygen available in that ocean to support life, a hundred times more oxygen than previously estimated. Richard Greenberg is the author of the recent book “Unmasking Europa: The Search for Life on Jupiter’s Ocean Moon.” He presented his findings at the 41st meeting of the American Astronomical Society’s Division for Planetary Sciences. Heh! Until the last two paragraphs I was thinking “but this is terrible!” But with a delay until oxygenation, wonderful. Regarding habitability I haven’t read much, but the earlier modeling efforts I’ve seen have been Drake equation type estimates. However, Mendez have developed quite a nice quantitative method, where Mars and Europa places just behind Earth in global habitability, based on planetary models. Due to its large ocean Europa compares well with Earth in potential biomass. See the nice diagram! I have to ask the question about energy flow through. I am not an expert on this topic, but life requires more than water and oxygen. You must have energy flow through at a sufficient rate to keep biological systems going. Lawrence, the common notion is that most of the energy for life would come from the same source the energy needed to keep the ocean liquid comes from, i.e., tidal dissipation and radioactive decay. That heat wouldn’t be directly used, but would generate chemical species that can be used for chemiossynthesis, much like happens on Earth’s deep oceanic vents. There are some exotic ideas involving surface organisms along the cracks, using solar power, but they are pretty exotic indeed. It would probably make a rather poor biosphere, but I think it’s very possible. 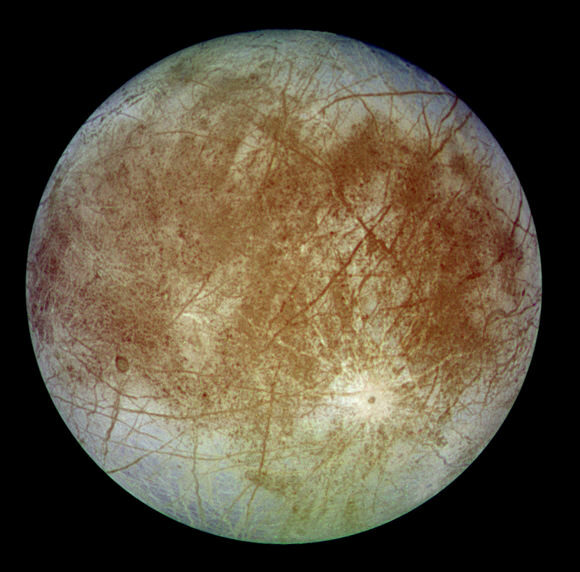 Until we send a probe to Europa we’ll never know whether life exists or not, but nonetheless, this is exciting news. LC,(or anyone else) what types of challenges would we face in actually landing a robotic probe on the surface? I can imagine they would be immense. I have an alternative interest in Europa. I have this idea of using acoustical tomography to map out the tracks from cosmic rays frozen in the ice. Effectively there should be 10^6TeV particle physics frozen on that moon. So it would be of interest to me if a probe were landed there with a rover that conducted these measurments. As for getting under the ice caps, that might be tough. I suppose a nuclear reactor that generates a lot of heat might melt its way through eventually. From there a probe capable of managing what ever environment under there might then conduct a search for life. The mission profile would be considerable, and costly. There is no atmosphere where parachutes can be used, so it has to retrorocket all the way down. Fortunately the moon is pretty small so the gravity is not much. To be honest I would imagine the landing craft to be the size of the Apollo lunar module. There would then be a rover deployed to study the surface (with my particle physics “sonogram” included I hope) and an nuclear reactor “drill” probe dropped through the ice. Once through some probe would proceed to explore this environment. I am aware there is some Jovian mission planned set to flyby Europa to detect the thickness of the ice. This will of course have some bearing on the potential presence of life there. William928, there’s development in at least US, and surprisingly Sweden, on free roving ‘worms’ and subs to be able to get to and maneuver underground water bodies. Of course the best work is the US sub resources, but swedish research interests in miniature worm probes akin to the miniature SMART probe technology may well pay off in terms of ROI. Think of a “multiple probe head” doing the difficult drilling down, and then releasing a swarm of probes. Or you could perhaps go for a smaller drill. There’s some thought going into how to minimize biological contamination too, I believe. Not that it’s a big concern of mine, any native organisms will compete well with imports, it’s just a free snack for them. In fact, I believe you could make a good argument for culturing probe surfaces with known and genome mapped organisms instead. I don’t know why they are getting excited about the availability of oxygen on Europa because oxygen was highly toxic to early life. It wasn’t until long after the origin of life that oxygen was used by most organisms and this was a very lengthy transition. It seems to me that the availability of high concentrations of oxygen would decrease the possibility that life exists there, unless the oxygen comes from life itself. If it comes from solar wind and geological processes, it would likely inhibit the formation of life because oxygen is so reactive. I’d like to know how that water was created in the first place? Solar system formation remnant? or perhaps through a ongoing/continuing process? Does Sol, as part of its internal mixing and evolutionary process continually release ionized oxygen and hydrogen? Yes? And perhaps in historical times with volume to create spontaneous coincidental Ice ages throughout the solar system? Kawarthajon you didn’t read the article did you? The oxygen took a couple of billion years to build up, providing time for life to arise. This isn’t exactly news though. There was a paper on this idea a couple of years back.